The computistical materials at the beginning of this manuscript were drawn up in 1380 at the request of the mother of Richard II, Lady Joan Holland. 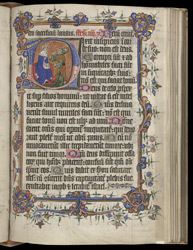 It used to be thought that this was the original presentation copy made for Joan, hence the name the 'Princess Joan Psalter'. Two of its historiated initials are by Joannes, one of the leading artists of early 15th-century London. The subject of the historiated initial 'D' to Psalm 52 is inspired by the opening words of the text, 'The fool says in his heart, "There is no God. "': the image shows a court jester, or fool, before King David. This initial has been attributed to the an artist who is known only by his first name: 'Johannes'.